Two active compounds, baicalein and its glycoside baicalin were found in the dried root of Scutellaria baicalensis Georgi, and reported to be neuroprotective in vitro and in vivo. 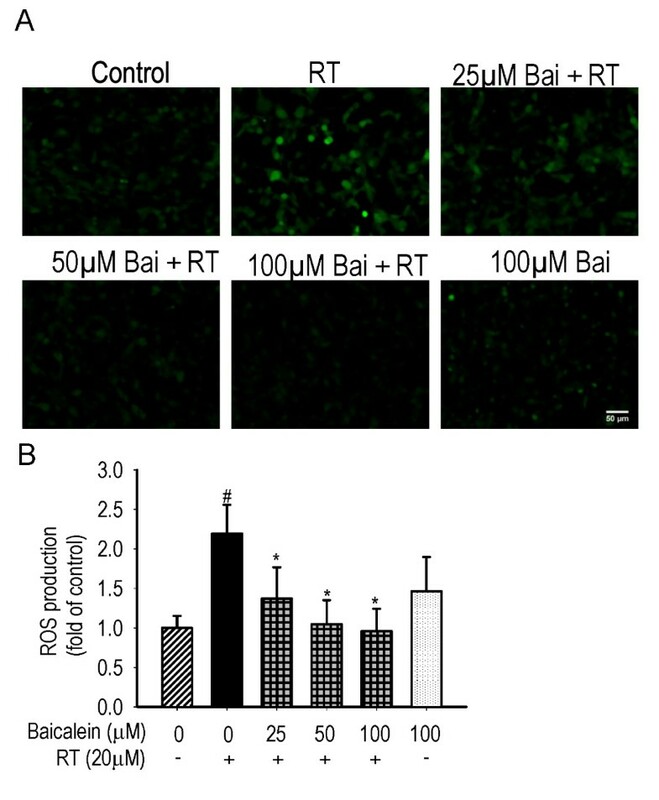 This study aims to evaluate the protective effects of baicalein on the rotenone-induced apoptosis in dopaminergic SH-SY5Y cells related to parkinsonism. Cell viability and cytotoxicity were determined by MTT assay. The degree of nuclear apoptosis was evaluated with a fluorescent DNA-binding probe Hoechst 33258. The production of reactive oxidative species (ROS) and loss of mitochondrial membrane potential (ΔΨm) were determined by fluorescent staining with DCFH-DA and Rhodanmine 123, respectively. The expression of Bax, Bcl-2, cleaved caspase-3 and phosphorylated ERK1/2 was determined by the Western blots. Baicalein significantly increased viability and decreased rotenone-induced death of SH-SY5Y cells in a dose-dependent manner. 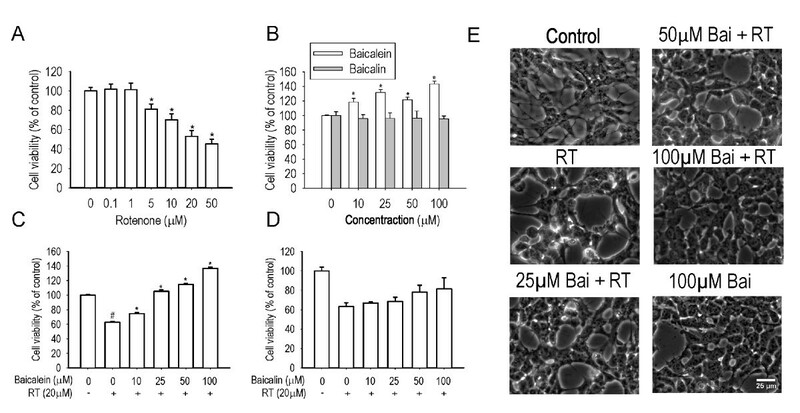 Pre- and subsequent co-treatment with baicalein preserved the cell morphology and attenuated the nuclear apoptotic characteristics triggered by rotenone. Baicalein antagonized rotenone-induced overproduction of ROS, loss of ΔΨm, the increased expression of Bax, cleaved caspase-3 and phosphorylated ERK1/2 and the decreased expression of Bcl-2. The antioxidative effect, mitochondrial protection and modulation of anti-and pro-apoptotic proteins are related to the neuroprotective effects of baicalein against rotenone induced cell death in SH-SY5Y cells. Parkinson's disease (PD) is a neurodegenerative disease mainly characterized by loss of dopaminergic neurons in the substantia nigra pars compacta . Although the pathology of PD is not understood well, the neurotoxic animal models of PD represent some key neurobehavioral or pathological features . Three neurotoxins, 6-hydroxydopamine (6-OHDA), 1-methyl-4-phenyl-1,2,3,6-tetrahydropyridine (MPTP) and rotenone, are the agents to induce parkinsonism in vitro and in vivo . An extensive study of these models defined important cellular actions of cell death and offered a basis for the development of novel therapeutic strategies . Rotenone, a lipophilic pesticide, can cross cell membrane easily to induce systemic inhibition of mitochondrial complex I and cause selective nigrostriatal dopaminergic degeneration . Rotenone-induced apoptosis in human neuroblastoma SH-SY5Y cells was mediated by the generation of mitochondrial reactive oxygen species (ROS) . The rotenone model of PD has been used for identifying potential neuroprotective agents in recent years . This model would enable scientific re-evaluation of various herbals for treating PD  and facilitate the development of novel anti-parkinsonian drugs . Baicalein and its corresponding glycoside baicalin are two flavonoid compounds found in the dried root of Scutellaria baicalensis Georgi. A series of studies demonstrated the neuroprotective effects of baicalein or baicalin in experimental models of Alzheimer's disease [10, 11], ischemic stroke [12–15] and PD [16–19]. Baicalein was reported to be effective on 6-OHDA models [18, 20, 21] and MPTP models [19, 22] of PD. 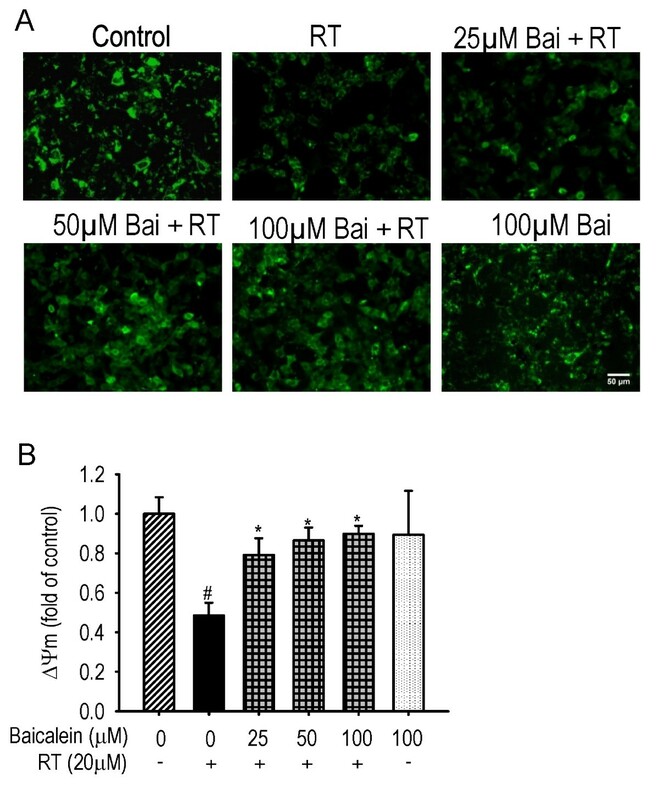 This study aims to investigate the neuroprotective effects of baicalein or baicalin on rotenone-induced cellular toxicities (SH-SY5Y cells) in vitro and in vivo. Baicalein and baicalin (Figure 1) with purity > 98% were purchased from Shanghai Innovative Research Center of Traditional Chinese Medicine (SIRC/TCM). Stock solutions (100 mM) were prepared in DMSO and diluted with serum-free medium. Dulbecco's Modified Eagle Medium with Nutrient Mixture F-12 (DMEM/F-12), Fetal Bovine Serum (FBS) and Penicillin-Streptomycin were purchased from GIBCO BRL (Grand Island, NY, USA). 2,7-Dichlorofluorescein diacetate (DCFH-DA) and Rhodanmine 123 (Rh123) were purchased from Molecular Probes (Invitrogen, CA, USA). Rotenone, Hoechst 33258, 3-(4,5-dimethylthiazol-2-yl)-2,5-diphenyltetrazolium bromide (MTT), RIPA buffer, BCA Protein Assay Kit and other chemicals were obtained from Sigma-Aldrich (St. Louis, MO, USA). PVDF membrane was purchased from Millipore (MA, USA). Primary antibodies against Bax (D21), Bcl-2 (C21), β-actin and horseradish peroxidase (HRP)-conjugated secondary antibodies were purchased from Santa Cruz Biotechnology (Santa Cruz, CA, USA). Primary antibodies against phospho-p44/42 MAPK (ERK1/2) (Thr202/Tyr204) and cleaved caspase-3 (Asp175) were purchased from Cell Signaling (Beverly, MA, USA). ECL™ Western blotting detection system was purchased from Amersham Biosciences (Piscataway, NJ, USA). The chemical structure of (A) baicalein and (B) baicalin. Human neuroblastoma SH-SY5Y cells (passage ≤ 25) were cultured as described in our previous study  and then treated with different concentrations of rotenone, baicalein or baicalin respectively in serum-free medium for 24 hours to determine their cytotoxicity. To evaluate the protective effects, we pretreated SH-SY5Y cells with different concentrations of baicalein or baicalin for 1 hour and subsequently rotenone was added to the cells for another 24 hours. The final concentration of DMSO in the medium was 0.5%, and showed no cytotoxicity to the cells. SH-SY5Y cells seeded on 96-well plates at 80-90% confluence were used in the MTT assay as described in our previous study . In brief, the medium was removed after the treatment. MTT solution (50 μl, 0.5 mg/ml in DMEM/F12) was added to each well and incubated for 4 hours at 37°C. MTT lysis buffer containing 50 μl of 20% SDS (sodium dodecyl sulfate), 50% DMF (N, N-dimethylformamide), adjusted to pH4.7 by HCl (hydrogen chloride) was then added before overnight incubation of the cells at 37°C to dissolve formazan. The absorbance at 570 nm was measured by a microplate reader (Model 680, Bio-Rad Laboratories, UK). The cell viability was expressed as percentage of the control. SH-SY5Y cells were incubated with different concentrations of baicalein in serum-free medium for 1 hour, followed by the co-treatment with rotenone (20 μM) for another 24 hours. Chromosomal DNA was stained with a fluorescent DNA-binding probe Hoechst 33258 (5 μg/ml) for 5 minutes, washed with PBS and then observed by a Axiovert S-100 Zeiss fluorescent microscope (Carl Zeiss, Zürich, Switzerland) at 20×. The morphological changes were visualized by phase-contrast imaging at 20×. SH-SY5Y cells were pre-incubated for 1 hour with different concentrations of baicalein and then co-treated with rotenone (20 μM) for another 24 hours in serum-free medium. Total proteins were extracted using RIPA buffer. Protein determination was by a BCA Protein Assay Kit. Denatured proteins (30 μg) were size fractionated by 12.5% SDS-polyacrylamide gels. Proteins were transferred to PVDF membrane at 80 V for 3 hours. The blots were blocked for 1 hour at room temperature in fresh blocking buffer (0.1% Tween-20 in Tris-buffered saline, pH7.4, containing 5% BSA). The membrane was incubated overnight at 4°C with primary antibodies against Bax, Bcl-2, cleaved caspase-3 and phosphorylated ERK1/2 at dilution of 1:1000. β-actin was used as a loading control. The membrane was incubated for 2 hours with HRP-conjugated secondary antibodies at a dilution of 1:2000. Signals were detected using ECL™ Western blotting detection system. Protein bands were semi-quantified by densitometric analysis using Image J software. Each experiment was performed at least three times, and the results were presented as means or means ± standard deviations (SD). One-way analysis of variance (ANOVA) followed by Student-Newman-Keuls test for multiple comparison was performed using the SigmaPlot 11.0 software packages (Systat Software Inc., San Jose, CA, USA). Exact P values were unavailable due to the software features (Additional file 1 provides a screen snapshot for example). Dose dependence was visually determined from the dose-response graphs. A probability value of P < 0.05 was considered to be statistically significant. In this study, we evaluated the effects of baicalein and baicalin on rotenone-induced cell death, nuclear apoptosis, production of intracellular ROS, loss of ΔΨm, expressions of Bax, Bcl-2 and caspase-3, and phosphorylation of ERK1/2 in SH-SY5Y cells. The cytotoxicity of rotenone, baicalein and baicalin were determined by MTT assay, Figure 2A shows that the cell viability was decreased in a dose-dependent manner (P < 0.01) by the treatment with rotenone for 24 hours. Rotenone (20 μM) triggered about 50% cell death and this concentration was chosen for subsequent experiments. Both baicalein and baicalin showed no cytotoxicity at the concentrations ranged 10-100 μM. Figure 2B shows that baicalein increased cell viability by 20-40% (P < 0.01) at all the tested concentrations, compared with the control. Effects of baicalein and baicalin on rotenone-induced cell death in SH-SY5Y cells. 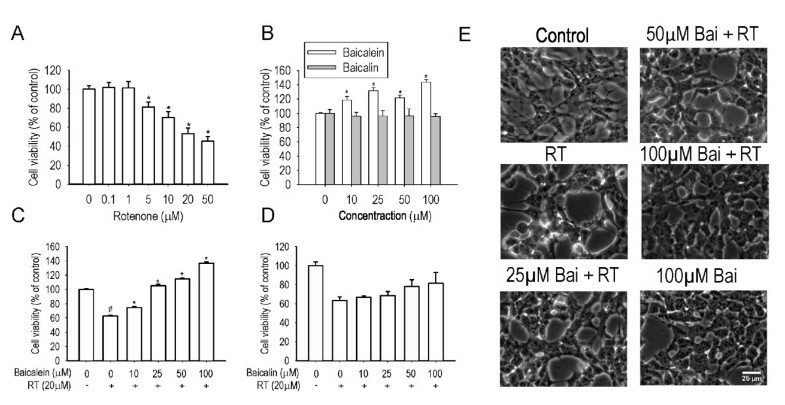 Cells were incubated with increasing concentrations of rotenone (A), baicalein and baicalin (B) respectively for 24 hours in serum-free medium (n = 6, *P < 0.01 versus control). Cells were pretreated with baicalein (C) or baicalin (D) for 1 hour and then cotreated with 20 μM rotenone for 24 hours in serum-free medium (n = 6, #P < 0.01 versus control, *P < 0.01 versus rotenone treatment). E: The morphological change was visualized by phase-contrast imaging. Scale bar: 50 μm. The effect of baicalein and baicalin on rotenone-induced cell death was evaluated. Figures 2C-D show that pre- and subsequent co-treatment of baicalein significantly inhibited rotenone-induced cell death in a dose-dependent manner (P < 0.01). Baicalein (25-100 μM) increased the cell viability up to or even more than the control level (P < 0.01). 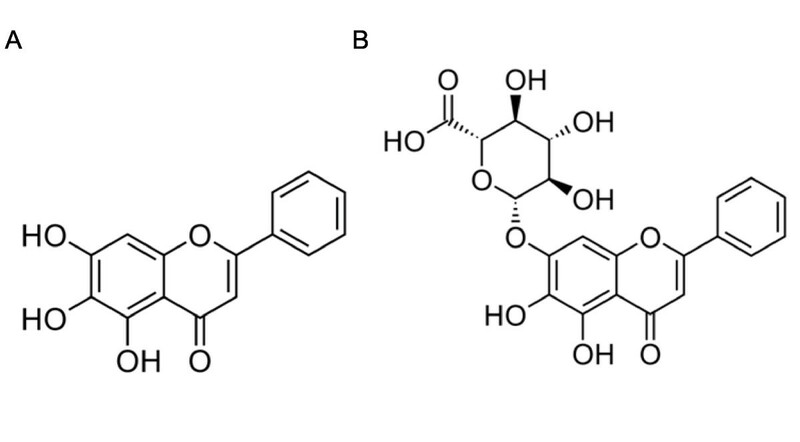 In consistency with the MTT result, the morphological observations revealed that baicalein significantly reversed the cellular damage triggered by rotenone, as shown in Figure 2E. However, baicalin showed no statistically significant protective effect against rotenone-induced cell death. Compared with the control, the apoptotic characteristics induced by the rotenone treatment, such as nuclear condensation and fragmentation, could be attenuated by pre- and subsequent co-treatment with increasing concentrations of baicalein (as shown in Figure 3). The statistical data showed 4.29 ± 0.69 folds of increase in the ratio of apoptotic cells triggered by rotenone, which could be reduced to the control level by pre- and subsequent co-treatment with increasing concentrations of baicalein (P < 0.01). Baicalein treatment for 24 hours had no significantly effect on nuclear apoptosis. Effects of baicalein (Bai) on rotenone (RT)-induced nuclear apoptosis. Cells were pretreated with Bai for 1 hour and then cotreated with 20 μM RT for 24 hours in serum-free medium. (A) Representative nuclear morphology. Scale bar: 50 μm. (B) Statistical analysis of apoptotic cells. At least 600 randomly selected cells were counted in each experiment (n = 3, #P < 0.01 versus control, *P < 0.01 versus RT treatment). Figure 4 demonstrates that rotenone treatment induced 2.19 ± 0.36 folds of increase in the intracellular ROS compared with the control (P < 0.01). Pre- and subsequent co-treatment with baicalein reduced the production of ROS in a dose-dependent manner (P < 0.01) down to the control level. Baicalein treatment for 6 hours showed no significant effect on ROS production as compared with the control. Effects of baicalein (Bai) on rotenone (RT)-induced ROS overproduction. Cells were pretreated with Bai for 1 hour and then cotreated with 20 μM RT for 6 hours in serum-free medium. The ROS generation was determined by the mean fluorescent intensity (MFI) of DCFH-DA. (A) Representative fluorescent images. Scale bar: 50 μm. (B) Statistical analysis. At least 600 randomly selected cells were counted in each experiment (n = 3, #P < 0.01 versus control, *P < 0.01 versus RT treatment). The inhibition of complex I by rotenone may induce loss of ΔΨm and the release of pro-apoptotic proteins . As shown in Figure 5, rotenone treatment led to about 2 folds of decrease in Rh123 fluorescence (P < 0.01), reflecting the loss of ΔΨm. Pre- and subsequent co-treatment with baicalein significantly inhibited the loss of ΔΨm in a dose-dependent manner (P < 0.01). Baicalein treatment for 6 hours showed no significant effect on ΔΨm as compared with the control. Effects of baicalein (Bai) on rotenone (RT)-induced loss of ΔΨm. Cells were pretreated with Bai for 1 hour and then cotreated with 20 μM RT for 6 hours in serum-free medium. The ΔΨm was determined by the mean fluorescent intensity (MFI) of Rh123. (A) Representative fluorescent images. Scale bar: 50 μm. (B) Statistical analysis. At least 600 randomly selected cells were counted in each experiment (n = 3, #P < 0.01 versus control, *P < 0.01 versus RT treatment). To further characterize the mechanism of baicalein inhibition on rotenone-induced apoptosis, we determined the effect of baicalein on the expression of anti- and pro-apoptotic proteins by Western blots. As shown in Figure 6, the expression of Bax and cleaved caspase-3 was increased while the expression of Bcl-2 was significantly decreased by the treatment with rotenone (20 μM) for 24 hours (P < 0.05), compared with the control. Pre- and subsequent co-treatment with increasing concentrations of baicalein gradually restored the imbalanced expression profile of these proteins. Interestingly, baicalein treatment alone for 24 hours could reduce the base levels of Bax (0.86 ± 0.07) and cleaved caspase-3 (0.71 ± 0.09) (P < 0.05). Effects of baicalein (Bai) on rotenone (RT)-induced imbalance in the expression of Bax, Bcl-2, cleaved caspase-3 and phopho-ERK1/2. Cells were pretreated with Bai for 1 hour and then cotreated with 20 μM RT for 24 hours in serum-free medium. Blots were stripped and reprobed for β-actin as a loading control. (A) Representative protein bands. (B) Statistical analysis. The corresponding bar graph represented data quantified from three independent experiments (n = 3, #P < 0.05 versus control, *P < 0.05 versus RT treatment, **P < 0.05 versus control). It was reported that rotenone induced ERK1/2 phosphorylation and neuronal degeneration in hippocampus neurons . Similar to this finding, we detected 2.47 ± 0.18 folds of increase in the expression of phosphorylated ERK1/2 in SH-SY5Y cells by treatment with rotenone for 24 hours, as shown in Figure 6 (P < 0.05). Pre- and subsequent co-treatment with baicalein reduced the expression of phosphorylated ERK1/2 down to the control level in a dose-dependent manner. Baicalein treatment alone for 24 hours could also significantly reduce the base level of ERK1/2 phosphorylation. In the study, we evaluated the neuroprotective effects of baicalein on rotenone-induced SH-SY5Y cell apoptosis. In the neurotoxic models (6-OHDA and MPTP/MPP+) of PD, either baicalein or baicalin has been reported to be effective [18, 22, 25]. However, we found that only baicalein showed a significant inhibition on rotenone-induced cytotoxicity as demonstrated in Figure 2D. Choi et al. demonstrated that baicalein was protective against endoplasmic reticulum (ER) stress-induced ROS accumulation and apoptosis. The difference between baicalein and baicalin in antioxidative potential and cellular permeability might contribute to their difference in cytoprotective effects against ER stress-inducers . These two factors may also account for the different effects of baicalein and baicalin on rotenone-induced cytotoxicity. 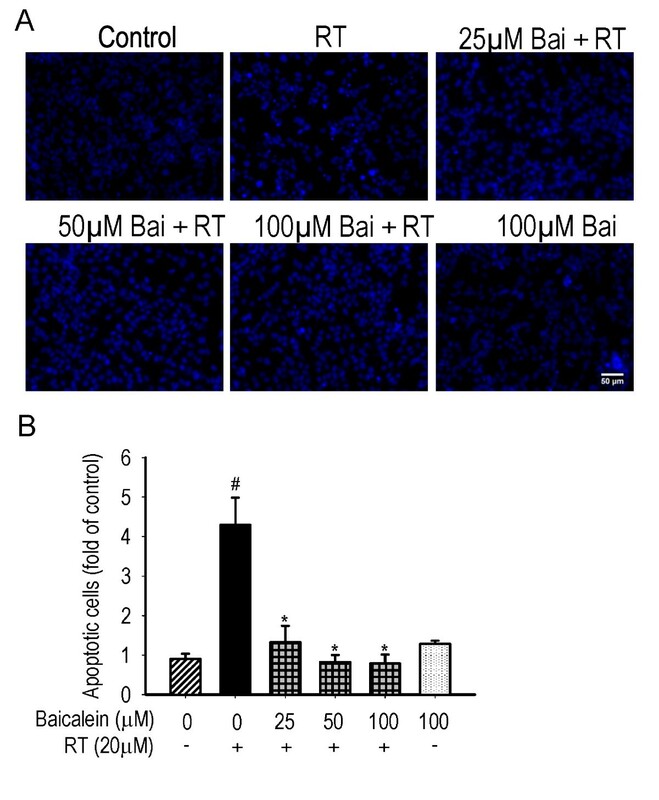 MTT cell viability assay showed that baicalein antagonized rotenone-induced cell death, which may be due to the ability of baicalein in increasing the cell viability of normal cells, as indicated in Figure 2B. The cell viability was reduced to 62.64% (P < 0.01) by treatment with rotenone alone for 24 hours while pre- and subsequent co-treatment with baicalein (100 μM) increased the cell viability to 137.01% (P < 0.01), as shown in Figure 2C. Baicalein (100 μM) treatment alone induced 43.46% increase (P < 0.01) in cell viability (Figure 2B) and the difference in cell viability (Figure 2C) between rotenone treatment alone (62.64%) and baicalein (100 μM) pre and co-treatment (137.01%) is 74.37%, suggesting that the cell proliferating activity of baicalein (43.46% increase) does not account for its protection against rotenone-induced cell death (74.37% increase). In other words, the protection of baicalein against rotenone-induced cell death may be independent of its cell proliferation activity. These results suggested that baicalein had protection against rotenone-induced cytotoxicity independent of its cell proliferation activity. Oxidative injury was proposed to be a primary mechanism of mitochondrial toxicity in the rotenone-induced degeneration of dopaminergic neurons [27, 28]. Impairment of complex I activity by rotenone led to excess ROS formation, which induced loss of ΔΨm and initiated apoptotic cell death [27, 28]. It was reported that baicalein suppressed the mitochondrial dysfunction induced by hydrogen peroxide and 6-OHDA, and the initiation of the loss of ΔΨm in PC12 cells and SH-SY5Y cells, respectively [17, 29]. This study confirmed these findings that baicalein inhibited ROS production and loss of ΔΨm triggered by rotenone in SH-SY5Y cells, resulting in cellular resistance against the initiating steps of apoptosis. This protection was mediated in part by its antioxidative ability and preservation of mitochondrial function. The balance of Bax and Bcl-2 proteins relates to the cell viability . Loss of ΔΨm increases the mitochondrial permeability and results in the release of cytochrome c from the mitochondria, which triggers activation of caspase-9/3 and ultimate cell death . In this study, we found that baicalein restored the imbalance of the expression profiles of Bax, Bcl-2 and cleaved caspase-3; baicalein treatment alone could also decrease the expression of Bax and cleaved caspase-3; and modulation of the pro- and anti-apoptotic proteins would be involved in the protective effects of baicalein against rotenone-induced neurotoxicity. Sustained ERK activation was reported to promote cell death in neuronal cells treated with neurotoxins [32–34]. Figure 6 demonstrates that rotenone triggering significant phosphorylation and activation of ERK1/2 was antagonized by baicalein pretreatment, indicating that inactivation of ERK1/2 pathway was involved in the neuroprotective effects of baicalein against rotenone-induced neurotoxicity. Inhibition of ROS overproduction, preservation of mitochondrial function, modulation of anti- and pro-apoptotic proteins and inactivation of ERK1/2 pathway are related to the neuroprotective effects of baicalein against rotenone-induced apoptosis in dopaminergic SH-SY5Y cells. This study was supported by grants from Seed Funding Programme for Basic Research from HKU (Project No. 201011159206) and funding from Stanley Ho Alumni Challenge (SHAC) Development and Alumni affairs office, HKU (Project No. 22100.20830019). JXS and KYBZ designed the study and drafted the manuscript. JXS, MYMC, KCKW and WWYC conducted the experiments and analyzed the data. SCWS and TBN revised the manuscript. All authors read and approved the final version of the manuscript.